​What if there was one simple, but profound process to completely uplift your energy, heal past pains, dissolve self-sabotaging thought patterns, find peace and support you with a strong routine for a nurturing spiritual practice? Basically, a reset button for life. It’s a 40-day yoga practice. This is not a quick fix and requires dedication, commitment and perseverance. Like many things on the spiritual path, just because something is simple doesn’t mean it’s easy. A few years ago, I felt so lost. I had followed my heart and the man that I loved but ended up in a place I hated and deeply resisted. With few career opportunities, I worked hard to build a freelance writing career, but everything felt misaligned even though I’d spent my entire life wanting to be a writer. I had no idea what to do and hated myself for not being able to figure it out. I deeply believed in a better future, but mistakenly thought the way there was to fight every moment. I fruitlessly tried to control the uncontrollable instead of relaxing and trusting that this moment held purpose, trusting that this moment was not separate from my path, but full of potential to explode me directly onto it. I knew there had to be a better way. I decided to surrender and asked the universe to show me the way. And it did. I was guided to a 40-day yoga practice. In the two-and-a-half years since completing this process, I have felt the electric bliss of unconditional self-love and released many deep, lifelong wounds of unworthiness and martyrdom. I started an entirely new path, creating a blog and social media presence that has attracted tens of thousands of readers. Even more fulfilling, I’ve created three deep, soulful courses that change people’s lives although I spent my entire life abandoning passion projects before they could gain any traction. This is what happens when you lift the hood under your soul, take a look around, and lovingly dissolve any blocks keeping you from living the life you’re destined for. Do the work and you will be rewarded. What is a 40-day yoga practice? It’s a process of completing the same exact yoga sequence every day for 40 days. I combined this practice with a few other key transformational elements to ensure the work I did was deep and lasting. Read on to discover the entire process. 40 days is a spiritually significant number that appears in many traditions. Of course Noah’s ark comes to mind, and in Judaism, 40 signifies renewal. New beginnings. “The number 40 has the power to lift a spiritual state,” according to Aish, a leading Judaism website. In Kundalini yoga, the type that I practiced, it’s said that 40 days is the minimum amount of time required to unwind old, destructive habits and create space for new ones. Our habits create our lives, and most of them are unconscious. After clearing the slate with a 40-day yoga practice, you have the awareness and knowledge to create your life anew. Kundalini yoga is more rhythmic and meditative than Hatha or vinyasa. It’s designed to powerfully move energy through the body, leaving you feeling amazingly peaceful and vibrant. You don’t have to do Kundalini for your 40-day yoga practice, but I highly recommend it. When you’re picking a sequence, make sure you select one that’s short enough to actually do everyday. Also make sure it’s gentle enough that you won’t need days off for muscle recovery. You could just practice yoga for 40 days. And that would be super powerful. But if you really want to shift your energy and change your life, you need to immerse yourself in a whole new way of looking at the world. 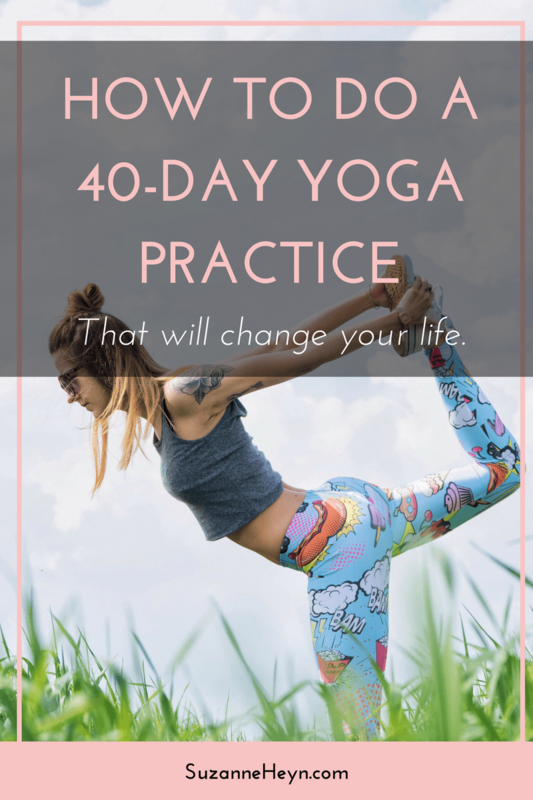 I read The Power of Now to supplement my 40-day yoga practice, and it helped me completely accept my life, which is the basis to all positive change. It’s tempting to fight and resist everything, but that only blinds you to all opportunities and keeps you stuck in misery. *The link above is an affiliate link and I receive a small percentage of the sale when you purchase. Thank you for your support! I’ve been a life-long journaler. It’s helped me heal massive heartbreak — from losing my father and sister as an early teen to surviving cancer at 27. Journaling helps you process your thoughts and emotions, working through them in a non-circular way. I love reading and then stopping whenever something resonates to explore it in my journal. This is a great way to illuminate unhealed wounds, thoughts/perspectives that need shifting and just generally absorb new truths on a deeper level. The special meditation technique I teach for dissolving emotional pain is best when practiced daily! Download it free and try for yourself! Used during the 40-day yoga practice, meditation helps you process the shifts you’re making on a deeper level so the energy you’re releasing doesn’t stay stuck within you, but fully moves through you. This powerfully clears the way for new habits, beliefs and perspectives. Once you have a blank canvas, you can paint any masterpiece you’d like. The best part is, once you finish this journey, you have a foundational spiritual practice that serves you forever. Because to truly shift, you have to keep doing this work. It’s a lifelong journey and not something you can do once and forget about it. But how do you stay committed? While this practice is transformational, you can see how it may be hard to actually finish the entire 40 days. How do you remember? How do you stay inspired to keep going? You might want someone to hold your hand and guide you every step of the way. That’s why I created The Big Shift, an online course and easy-to-follow roadmap that guides you step-by-step through this beautiful, transformative 40-day yoga practice! Once I experienced the transformation of this simple yet profound process, I knew I couldn’t keep it to myself. I’m not even a kundalini yoga teacher — I had to hire someone to record the practice for you! But once I tasted the bliss of freedom, nothing could stop me from offering this spectacular opportunity to all the world. I’m so excited to open The Big Shift for 2017 and welcome an intrepid group of soul travelers into its doors! Enrollment is open now through March 17 for the only time this year! Click here to learn more and sign up! It’s going to be wildly wonderful! Also on Tuesday, you’ll discover the profound truths of the universe that make this 40-day yoga practice so powerful and complete. Even if you don’t sign up for the course, this information will be super helpful in guiding you to your own breakthroughs. Can’t wait for Tuesday! Enter your email below this post to receive a meditation and be the first to know when enrollment for this spectacular opportunity opens. What are your go-to practices for shifting energy? Share in the comments below! Let’s inspire each other. Are you on social media? Let’s connect!